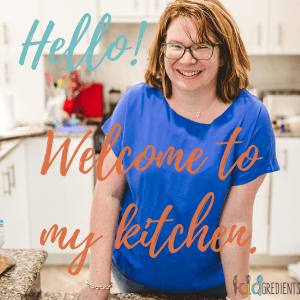 What can I bring? Nothing, just yourselves. That means bring this dip. It means your friend has seen this recipe for the cream cheese Christmas bauble and they want you to bring it. 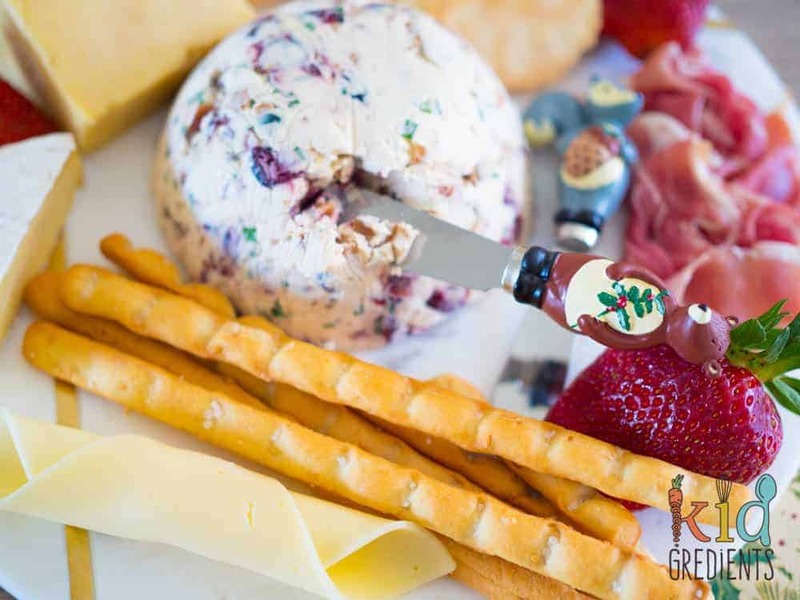 Macadamia and cranberry are synonymous with Christmas and with the subtle green of the chives you are onto a winner. Simultaneously sweet and savoury, this dip is a crowd pleaser. Make sure you have a taste as it goes on the table…or seriously, your hard work will be vanishing before your eyes! If you want to replace the nuts in this, then use some pepitas, and roast them for about 5-7 minutes. 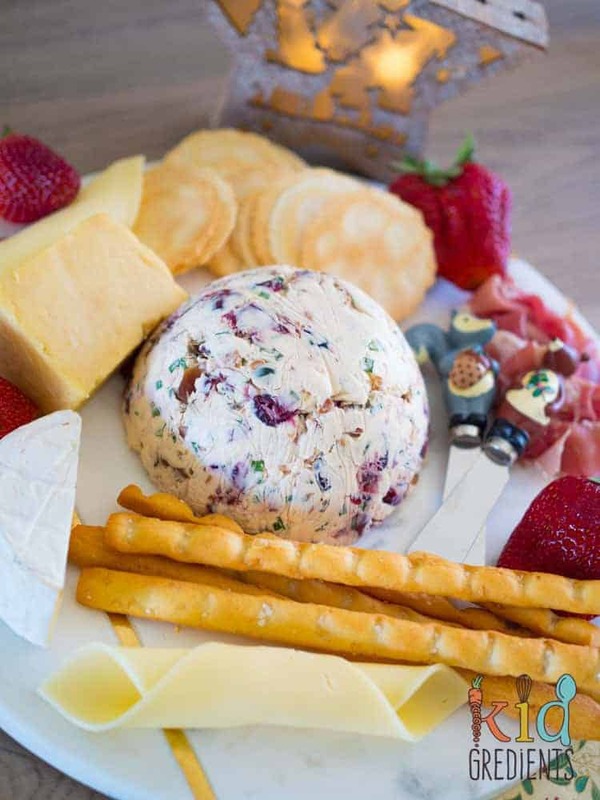 With festive colours and only 4 ingredients, you really can’t go wrong with this cream cheese Christmas bauble, it’s perfect with crackers, cold meats, dried fruits, fruit and breadsticks on a platter. It makes for an awesome centrepiece for any entertaining. If you want to be super fancy you can toast some extra nuts and press them to the outside, but to me, it’s pretty good as it is! I’ve even left two spreaders beside it…because two hands will be going for the dip at once, guaranteed. If you need some crackers to go with it, these lavosh would be perfect or even chopped up pretzels! 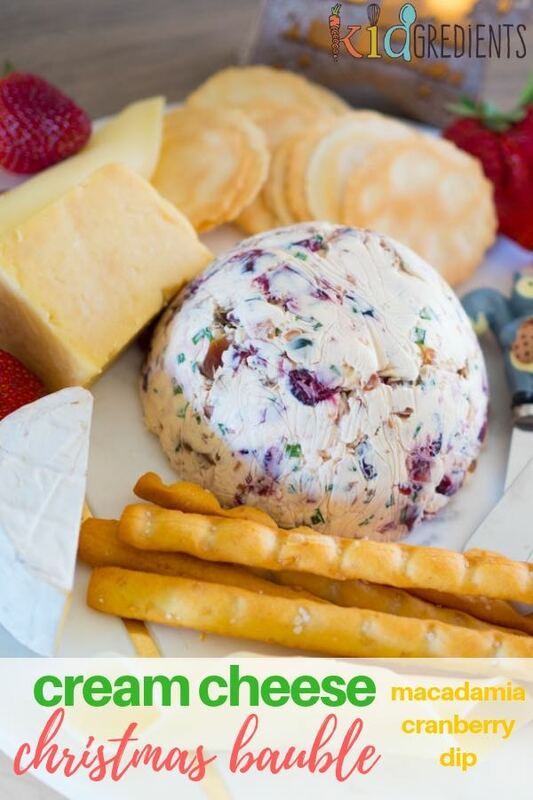 Now what else can you put on a festive cheese platter? We love smoked cheddar and it makes for a different flavour profile as it is much stronger. 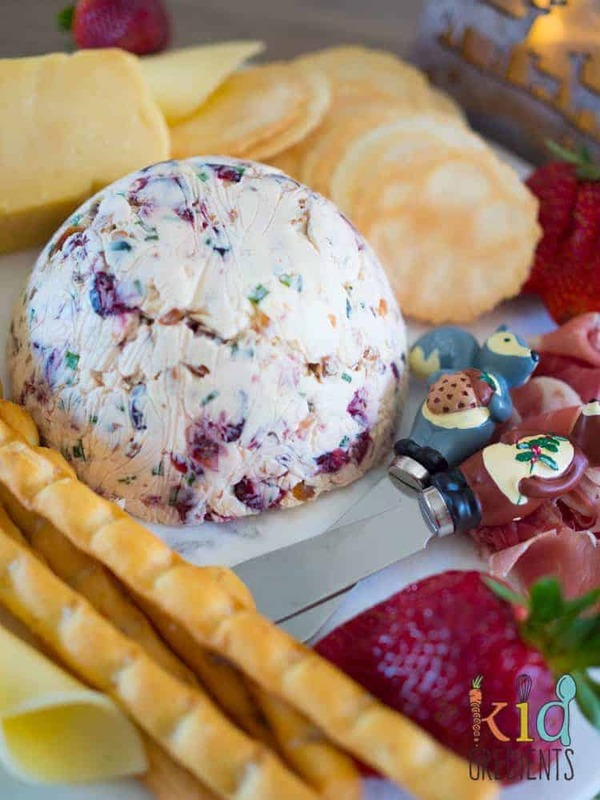 I like to always have camembert or brie on a platter as hey are crowd favourites (just ask master 5), prosciutto, gouda, because it rolls really nicely and is super yummy, strawberries, because they add to the festive look. Then a few different crackers, the classic water cracker pretty much always makes an appearance, and breadsticks are a favourite with the kids as well as the adults. My rule of thumb is to make it look like a bento box! note to self. Do not tie dye when you need to take blog photos- I have dye under all my nails! 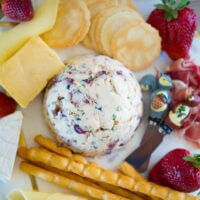 Yumi’s Anytime Dips Squeezable Awesomeness! 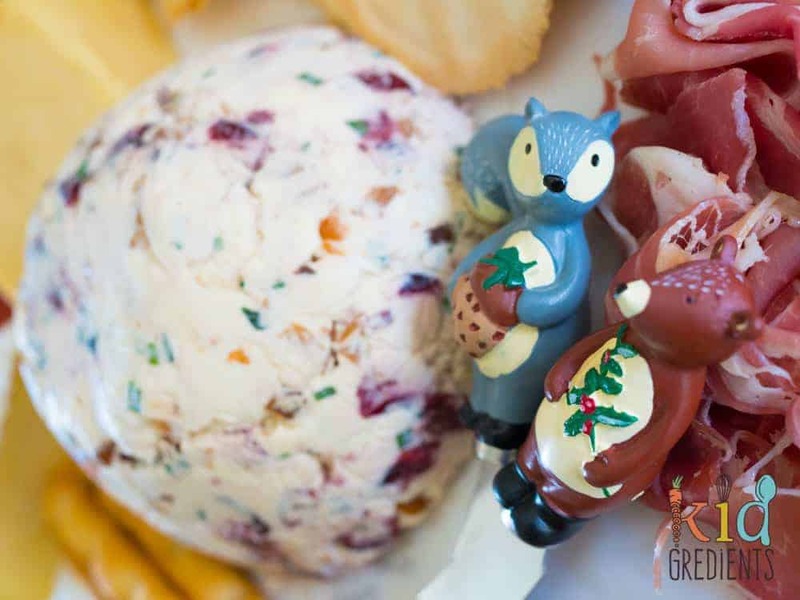 Cream cheese Christmas bauble, a macadamia and cranberry dip for the festive season. 250 grams philadelphia cream cheese, allowed to soften at room temp for 10 minutes. Place the macadamias on a tray and roast for 10 minutes. Place the cranberries in a jug and cover with boiling water for 10 minutes. Drain and allow to cool. Remove the macadamias from the oven and chop. Allow to cool. 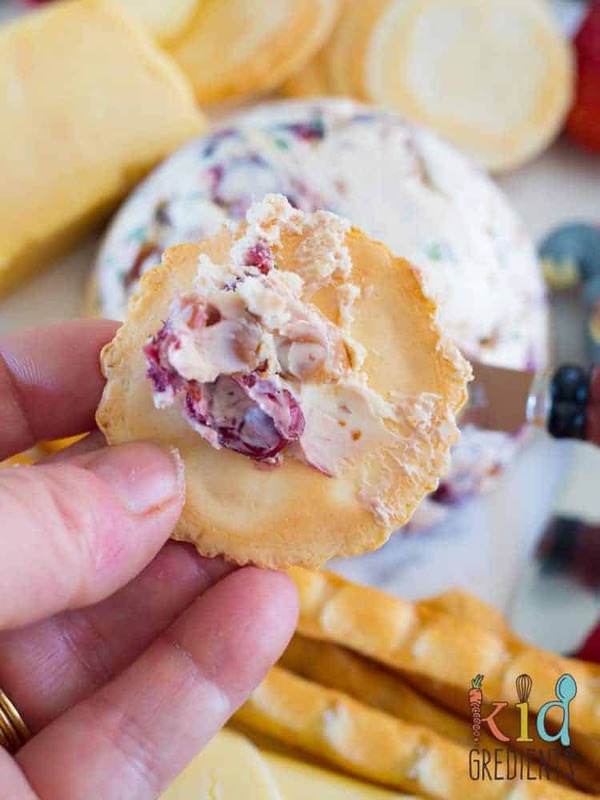 Combine the cheese, cranberries, nuts and chives in a bowl and mix well. Line a small bowl with clingfilm, (leave it hanging over the sides) and push the mixed dip into the bowl. Refrigerate for 2 hours or until solid. Remove from the bowl with the clingfilm and place on your serving platter then remove the clingfilm. Yes! It would be lovely!